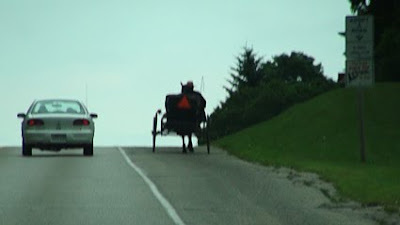 While driving down a road outside of Reedsville, PA, I took this picture of two people peacefully sharing a common space, heading toward unknown destinations as radically different from one another as the means of transportation taking them there. When looking at this, I come away with greater appreciation of the Network Effect and what it means for mankind. For starters, the Network Effect totally depends on on/off switches generating 0's & 1's at blinding speeds as this binary way of counting enables data of endless variety to be processed, stored and distributed in effortless fashion to anyone equipped with a computer/smartphone/netbook, etc., etc. (and connected to the network) capable of deciphering the flow of bits in question. Because 0's & 1's can be overlayed by a limitless set of variables i.e. color, currency type, the letter "t" etc., etc. the computer, as Universal Machine, and the network it runs, The Web, have become prime drivers of the Network Effect or the power of individuals and groups to instantly communicate and collaborate with one another using machines linked together via the net. Flash Mobing, Facebook, Linkedin and Twitter (not to mention Wikis, sites like PLOS, Blogs & news sites like Physorg & NYTimes) are just tiny samplings of information multipliers being used by millions in the attempt to better understand the profound changes happening in group consciousness being wrought by the connected age of the Network Effect. "The law has often been illustrated using the example of fax machines: a single fax machine is useless, but the value of every fax machine increases with the total number of fax machines in the network, because the total number of people with whom each user may send and receive documents increases." With regret, posting will now be moderated as BRT is getting spammed by bozos who have nothing better to do. We welcome valid comments, outrageous and otherwise so please don't hesitate to disagree or concur with the opinions on the blog. In a weird way, getting spammed is a perverse form of fanboydom as it shows the site's being seen. This scene from Blade Runner goes deeper then just image enhancement, rather, it shows, in indirect fashion, how sifting through information is akin to going into the Rabbit Hole. In Dekard's case, it leads to the girl, in many of mine, the destination changes depending on the data found. As example, the Gizmodo Fancy Math piece started the drill that created this piece.